As my Back to School Event is nearing the end, I have one of my most favorite projects to share! I've had Back to School wreath ideas in my head for awhile, and I finally had the time to sit down and play around until I landed on something I loved. When school time rolls around, the thing we all think of is school supplies, so I thought, why not put a whole bunch on a wreath?! 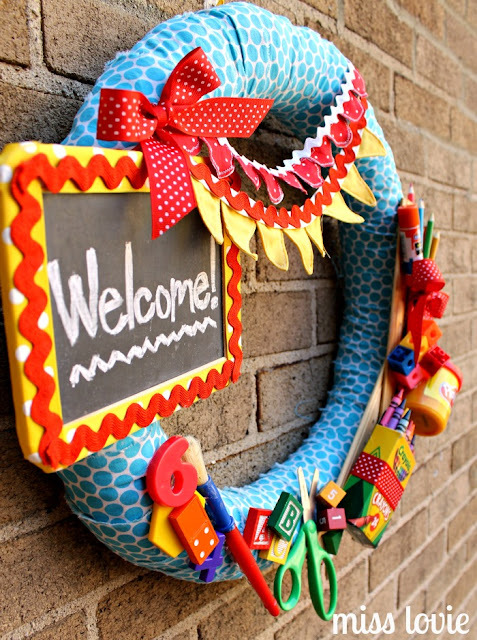 I love those pencil wreaths and crayon wreaths out there, but I teach kindergarten and we use a lot more "stuff" than that! 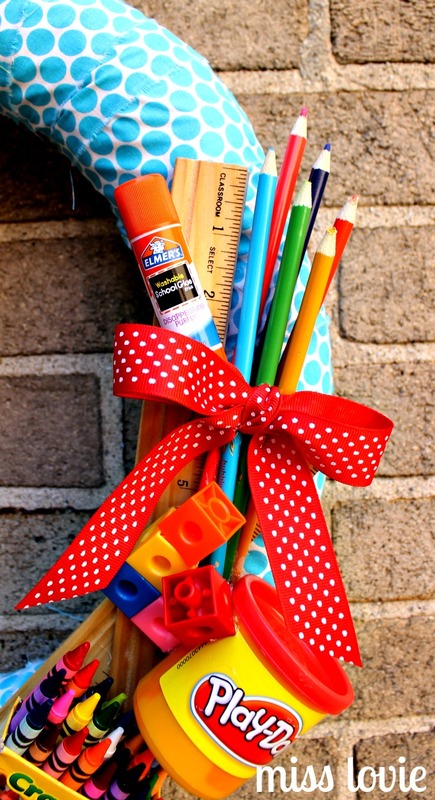 I wanted to included not only school supplies but the other things we use daily in our classroom. 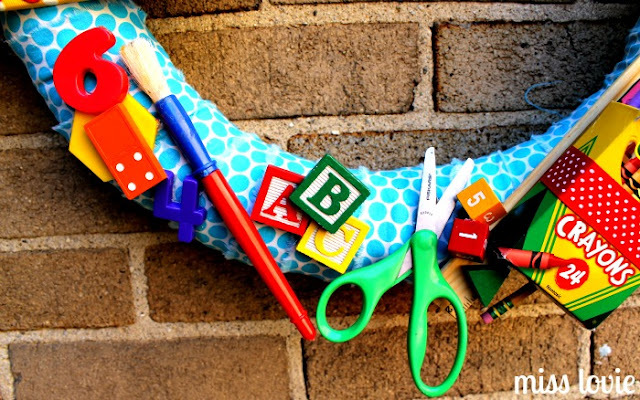 Any elementary teacher is familiar with lots of these: blocks, magnetic letters, dice, paint brushes, scissors, glue, play dough, connecting cubes, rulers, etc. 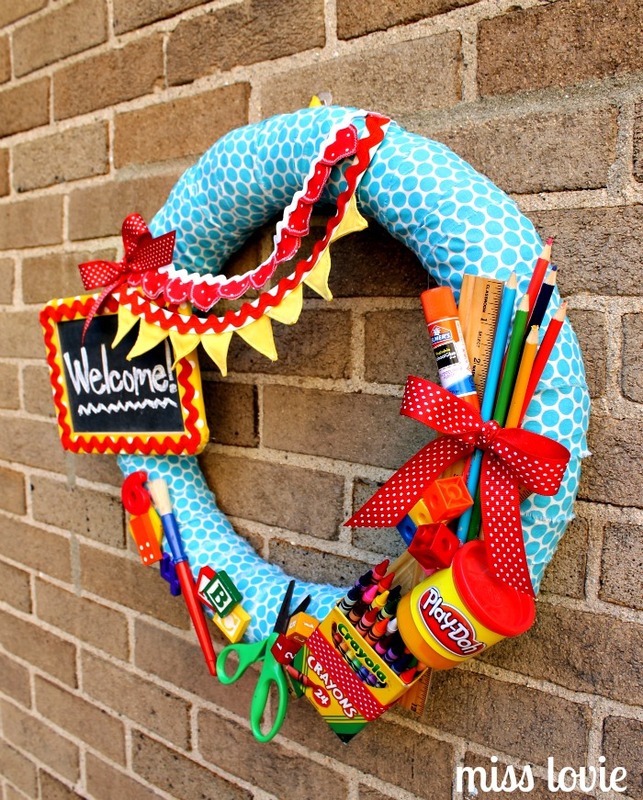 I wanted a wreath that represented our day in kindergarten. I really wanted to fit a tiny book on there, but I ran out of room. Ha. I added the chalk board and bunting for a little extra fun. The chalkboard's wooden border is covered in ribbon and rick rack. I wrote "Welcome" for the Back to School season, but I can change it throughout the year if I want. The bunting is just pinned on (it's a straw wreath form) so I could technically change it out if I wanted to. I didn't take pictures for a tutorial for this, but it's super simple. 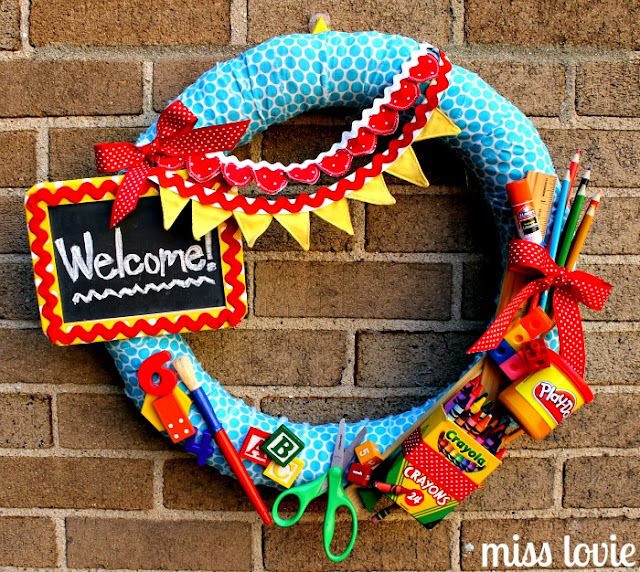 Wrap your wreath with strips of fabric, then hot glue a ton of "stuff on there. The end. Ha. I secured the chalkboard with some velcro wrapped around the wreath since it was a little wobbly, but everything else is stuck on really well. I hope you love it. It has definitely made my classroom door cheery. Even if you're not a teacher, it would be great to put on your front door when it's time for your kids to go back to school. Mr. Lovie was actually really sad I was taking it to school...he wanted to put it on our front door...(and we don't have kids)! Ha. Go check out the other Back to School Events! 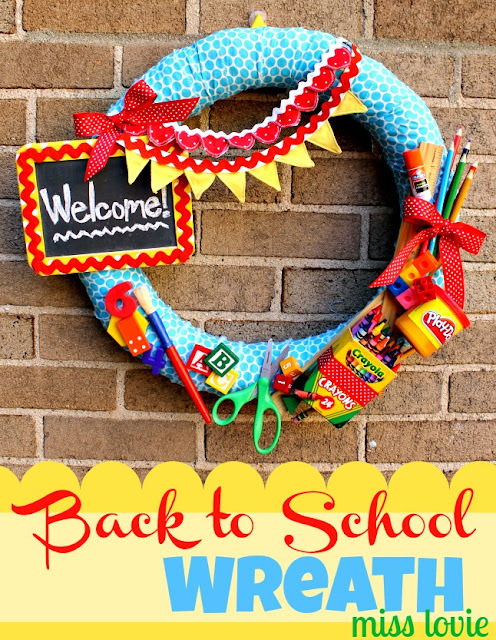 Go link up YOUR Back to School projects at my very first linky party ever! Any school-themed projects are welcome. I'll feature my favorites on Sunday! And come back tomorrow for one more Back to School idea! Adorable! 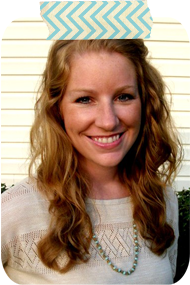 I recently started reading your blog and am really enjoying it. This is amazing. Love it. I love this for a gift for my son's teacher. Great job. I'm your newest fan thanks to this wreath! This is just the cutest thing EVER Allie! Love it! So perfect for a classroom door! This is adorable! Perfect for the classroom. 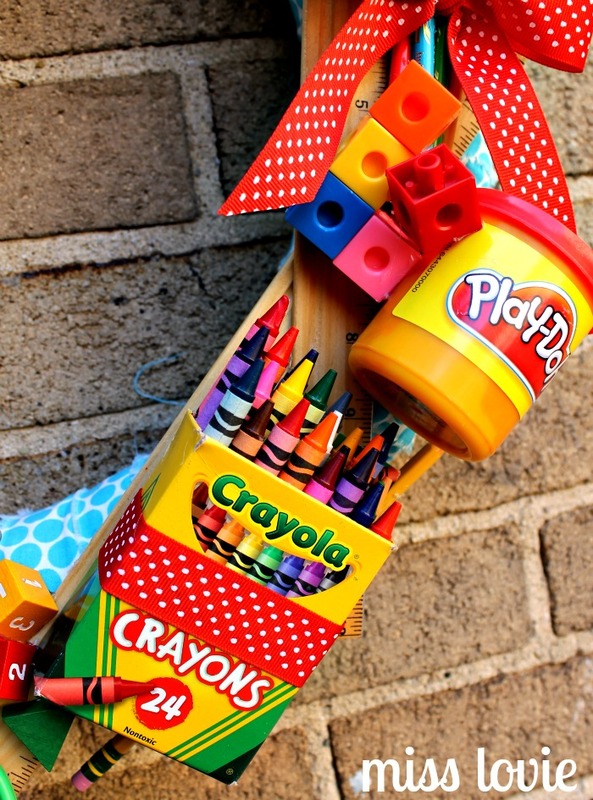 Oh I love this - what a fab idea & lovely cheerful colours. Would definitely help get the children back in the term time spirit. 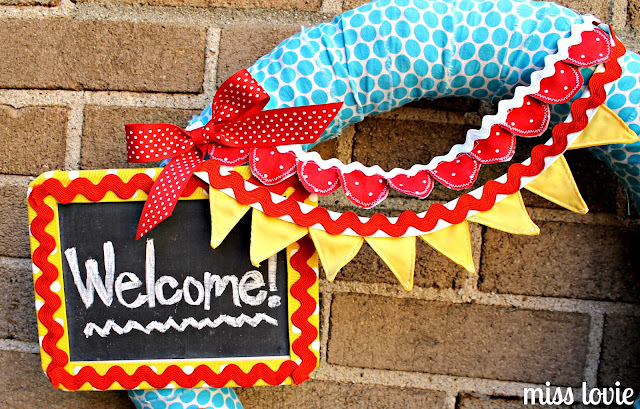 I loved this so much that I shared it in a roundup of Back-to-School projects on my blog today! You can see it here: http://justagirlandherblog.com/21-creative-back-to-school-projects/ Thanks so much for the inspiration!